My previous article on Litecoin mining I discussed how you can get started mining Litecoins, an alternative to the Bitcoin crypto-currency, using your spare CPU cycles. If you’re GPU is already mining Bitcoins, using your CPU to mine Litecoins may be an obvious choice. However, if you are “all in” on Litecoin then you can get a sizable performance increase by using your GPU to mine Litecoins. Whether that trade-off is worth-while is a decision you would need to make. Litecoin is not as mature as Bitcoin and is just as volatile. Some see it as a doomed clone, others as the next Bitcoin, poised to take off. 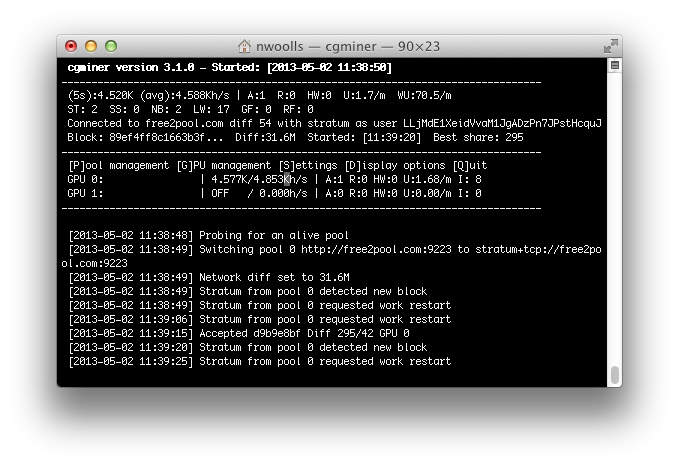 In order to start using your GPU to mine Litecoins on OS X, you’ll need to first install cgminer or bfgminer. Please read my previous article on Bitcoin mining for step-by-step instructions and installation packages for cgminer and bfgminer. The Homebrew formulas I shared in my previous article include the configuration settings necessary to mine both Bitcoins and Litecoins. If you are compiling the applications yourself, make sure to use the –enable-scrypt parameter when running ./configure. Armed with a copy of cgminer or bfgminer with scrypt enabled, you can now start mining Litecoins with your GPU. Now a fair warning: finding a nice set of parameters for mining Litecoins with cgminer or bfgminer is far more finicky and time consuming. With Bitcoins you can basically run either miner and just specify your pool. The miner will then tune itself and eventually reach a nice hash-rate. This isn’t really the case with using either miner to mine Litecoins. For instance, if I use the following command line to mine Litecoins using my ATI 5770. Note that I am using the -d parameter to specify which GPU to use to simplify these examples. With no additional tuning my 5770 gets about 5Kh/s. My CPU alone gets around 29Kh/s. Using bfgminer with the basic command-line parameters yields similar results. As indicated in my previous article I use the –no-opencl-binaries to work around a crash in bfgminer with multiple GPU’s on OS X. So how can we get better performance mining Litecoins on the GPU? The first parameter to focus on is the -I parameter, or the intensity. With Bitcoin this parameter does help, but honestly not a ton. If you aren’t using the PC, and you leave the intensity at “Desktop” (-I d), both cgminer and bfgminer will eventually reach around the same performance you’d get by specifying something like -I 9. This is not the case with Litecoin mining. With scrypt (Litecoin’s hashing algorithm) you need to specify a high intensity, in fact higher than is suggested for Bitcoin. I’d start at around 10 and go up from there. On my system, 15-16 is about the best I can do. 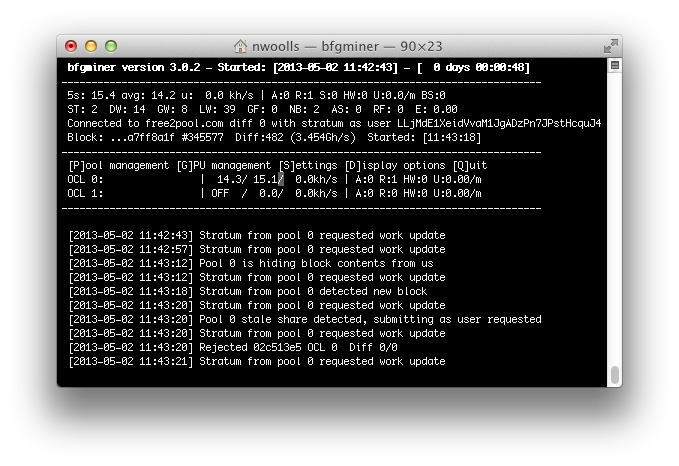 Similarly I get around 14Kh/s using the -I 13 parameter with bfgminer. Now we’re cooking with Crisco! Using -I 13 -w 64 on my 5770 gets me from the original 5Kh/s up to 83Kh/s with cgminer. And with bfgminer? 7xxx cards: 64 * bus-width-of-card-in-bits. So, for a 7950, that would be 64 * 384 = 24576. Ideal values are 21712 or 24000. Find your bus width here. I verified that 3200 works well with a 5770 and 4800 works well with a 6870. And that about covers it for my series of articles on mining Bitcoins and Litecoins using Mac OS X and Apple hardware. The growing landscape of crypto-currency is fascinating from many perspectives. If your interest is piqued and you are running OS X, hopefully you now have the information you need in order to get started mining this new form of currency. This entry was posted in CryptoCurrency, Technology on May 2, 2013 by Nathanial Woolls (Nate). Thanks for the excellent guides on starting mining on a Mac. I have been trying it out over the weekend on a couple of different laptops, one Air and one Pro. Obviously, neither of them are heavy hitters but the experimentation is quite fun. Error -54 can be fixed by playing with the Intensity. Start with [ -I d ] and see if it works. Try a worksize of 64 instead of 128. Also, try removing the lookup-gap. If things are stable then start upping the intensity. Doesn’t seem to make much of a difference sadly but hey..50 is better then my original 10. Hi gptsociety, If you’ve figured out how to GPU mine on 10.6.8 without reading code, please let me know. Thanks. Where does one gets the username and password for the Terminal commands? Thanks for the article. Where does one get a username and password for the Terminal commands please? You need to sign up for a mining pool for your chosen coin. Can I use this setup for Feathercoin? I have everything setup for Litecoin but it’s not mining properly. How do I indicate it to mine feathercoin and not litecoin. It should work as long as your arguments are valid for Scrypt mining. Litecoin and Feathercoin should work the same. What sort of problems are you having? I have tried to connect not using stratum and it works. [2013-09-17 17:00:05] Press any key to exit, or cgminer will try again in 15s. very good series, thank you. This had me stumped for a couple of hours today. As can be seen here: https://github.com/ckolivas/cgminer/blob/master/NEWS cgminer has no support for scrypt since version 3.8.0. You can “brew edit cgminer” and change the version numbers in the link to the file on github. When you try to install it you will get a SHA-hash error. Just copy the “actual” hash to the hash just below the URL you just changed and try the install again. This worked for me. Having trouble trying to install previous version. This has been a very helpful forum and I feel like I was so close. Now I”m stuck. Any advice/help be greatly appreciated. Try bfgminer. The cgminer team dropped support for GPU and scrypt mining. Can you help me? Sorry for the double post but I have tried everything. I am using a Sapphire 7950 on my Mac Pro tower and the best hashing rate I can get is 360 Kh/s mining Litecoins. I have seen that people have gotten up to 600 Kh/s with a 7950. What can I do on my computer to speed it up? Is it the mac versions of the 7950 that is slow? It seems I should be able to get 600 Kh/s. Thank you for your help. I use -g 1 –thread-concurrency 24000 for my 7950, but that is on Windows. Note that scrypt mining is notoriously difficult to tune and much more so on a Mac. I have never been able to get the same scrypt numbers on a Mac as I can in Windows. Is it the stock power supply? Is it the mac versions of the 7950 that is slow? It seems I should be able to get 600 Kh/s. Thank you for your help. Getting an Error -54 whenever I try and use bfgminer. Also, it doesn’t seem to recognize my Block Erupter USB miner. Any thoughts on what could be going wrong? I’ve been mining LTC and BTC on a Mac Pro using Asteroid. I seem to stably get 55kH/s without pushing my GPU temp over 80ºC. Any opinions on Asteroid? Am I sacrificing anything by using that app instead of a command line process? After that the GPUs fail to initialize, and the whole thing bogs down and goes no further. Thanks in advance for any help you might be able to lend.